A simple leather Archers Arm Bracer designed to protect the inner forearm while shooting longbows. Made to be worn on both the right or left arm and attaches with leather thongs. 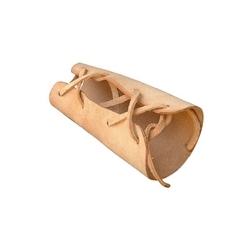 Our leather Archers Arm Bracer is made from comfortable quality pigskin. Available in a natural leather.